[S137] Elisha Scott Loomis, Joseph Loomis, Page 209. [S137] Elisha Scott Loomis, Joseph Loomis, Page 299. Lewis and Mary were enumerated in the 1850 Georgia, Franklin Co., VT, federal census. He was a merchant, age 28, she was 25. Children in the household were Helen M. 6, Julia 3, and Mary 1. Lewis and Mary were enumerated in the 1860 Delaware, Delaware Co., IA, federal census. He was 38, she was 34. Children in the household were Helen 16, Julia 13, Mary 10, and Allen 8. Lewis and Mary were enumerated in the 1870 Manchester, Delaware Co., IA, federal census. He was a produce dealer, age 49, she was 45. Children in the household were Mary 21. Allen R. 18, and Lewis A. 9. L. A. and Mary F. were enumerated in the 1880 Manchester, Delaware Co., IA, federal census. He was 59, she was 55. The only child in the household was Lewis A. 19. [S137] Elisha Scott Loomis, Joseph Loomis, Page 436. Allen R. and Phedora were enumerated in the 1850 Colchester, Chittenden Co., VT, federal census. He was a peddler and farmer, age 27, she was 29. Children in the household were Etta 3, and Lorinda A. 9 months. Allen and P. H. were enumerated in the 1860 Delaware, Delaware Co., IA, federal census. He was a farmer, age 37, she was 38. Childlren in the household were Etna 12, Lorinda 10, Alma 8, Jane 6, and Loriin 1. Allen and P.H. were enumerated in the 1870 Manchester, Delaware Co., IA, federal census. He was a Banker, age 46, she was 48. Children in the household were Lora 20, Alma 18, Jennie, 16, and Lorin 10. A. R. and "Parmele" were enumerated in the 1880 Manchester, Delaware Co., IA, federal census. He was 57, she was 59. There were no children in the household. Daughter Loomis was born at Milton, Chittenden Co., VT.1 She was the daughter of Reuben Loomis and Rhoda Jones.1 Daughter Loomis died; in infancy. Allen and Eva were enumerated in the 1880 Fort Dodge, Webster Co., IA, federal census, 4th Ward. He was a butter buyer, age 28, she was 24. Children in the household were Bertha 4, and Fred 2. Allen R. and Eva were enumerated in the 1900 Fort Dodge, Webster Co., IA, federal census, Ward 2. He was 48, she was 43. Children in the household were Fred 22 (shown born January 1888), and Elsie, 15 (shown born March 1885). Allen R. and Eva C. were enumerated in the 1910 Fort Dodge, Webster Co., IA, federal census. He was a poultry and egg merchant, age 58, she was 54. The only child in the household was Elsie, 24. [S137] Elisha Scott Loomis, Joseph Loomis, Page 548. Fred Leon Loomis was born on 30 December 1877 at Fort Dodge, Webster Co., Iowa.1 He was the son of Allen Reuben Loomis and Eva C. Davidson.1 Fred Leon Loomis married Grace Vincent on 17 September 1902.2 Fred Leon Loomis married Jane Elizabeth Hallowell, daughter of Peter Joseph Hallowell and Matilda Garland Scott, on 24 August 1953. Fred and Grace were enumerated in the 1910 Fort Dodge, Webster Co., IA, federal census. He was a poultry and egg buyer and seller, age 32; she was 30. There were two children in the household, Edith 6, and Allen R. 11 months. Fred and Grace were enumerated in the 1920 Fort Dodge, Webster Co., IA, federal census, ED 241. He was a general merchant, age 42, she was 40. Children in the household were Elizabeth 16, and Allen 10. Enumerated next door were father A. R., and Eva. Grace Vincent was born on 15 July 1879 at Fort Dodge, Webster Co., IA.1 She married Fred Leon Loomis, son of Allen Reuben Loomis and Eva C. Davidson, on 17 September 1902.1 Grace Vincent died circa 1952. Allen was president of the Fort Dodge Creamery Co., and owner of Rosedale Farms. Allen married Lili Damita, a famous movie actress (1901-1994) who had first married Errol Flynn. As a young French actress, Lili Damita could not have imagined she would end up a Hollywood star and later the wife of an Iowa businessman. Liliane Marie-Madeleine Carre was born in Bordeaux, France, and by age 16 was a music hall sensation, succeeding the legendary Mistinguette as star of the Casino de Paris revue. She appeared in French films starting in 1921, and acted in British, German and Austrian pictures between 1926 and 1928. American movie mogul Samuel Goldwyn lured her to Hollywood to star with Ronald Colman in "The Rescue" in 1929. She was one of many foreign-born actresses of the period to be touted as "the new Garbo." Also in 1929 she appeared in "The Bridge of San Luis Rey" and the box-office smash "The Cockeyed World," a sequel to "What Price Glory?" Her heavy accent did not reproduce well in talking pictures. Damita retired from the screen after her 1935 marriage to soon-to-be-superstar Errol Flynn. It was the first marriage for both. They were divorced in 1942, and their son, one-time actor Sean Flynn, disappeared in Cambodia in April 1970 while covering aspects of the Vietnam War as a photojournalist for Time and Life magazines. He was declared legally dead in 1984. Damita's second marriage was to Iowa businessman Allen Loomis, president of the Fort Dodge Creamery Co. and its famous Rosedale Farms. She lived in Fort Dodge from 1962 to 1983, until she and Loomis divorced. In her later years, Loomis suffered from Alzheimer's disease and died in West Palm Beach, Fla. There were no survivors. She is buried at Oakland Cemetery at Fort Dodge. 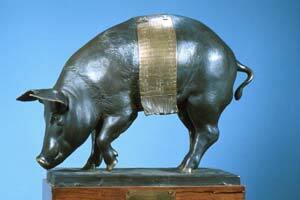 Allen was the donor in 1935 of the famous "Floyd of Rosedale," the pig now memorialized in bronze, that goes to the winner of the annual football rivalry between Iowa and Minnesota. Floyd was named for the governor of Minnesota at the time, Floyd Olson. [S182] Social Security Death Index (on-line), Ancestry.com, SSDI, Ancestry.com, SSAN 481-01-3994. James Webb married Maria Cook, daughter of Isaac Cook IV and Margaretta Scott. Maria Cook was the daughter of Isaac Cook IV and Margaretta Scott. Maria Cook married James Webb. [S810] Edwin W. Strickland II, William Buell, 1-8, page 172. Thomas King Jr. was born on 3 December 1684 at Northampton, Hampshire Co., MA.1 He was the son of Thomas King and Abigail Strong.1 Thomas King Jr. died; young. Abigail King was born on 31 January 1687 at Hatfield, Hampshire Co., MA.1 She was the daughter of Thomas King and Abigail Strong.1 Abigail King married Gershom Sexton on 20 January 1708/9 at Hartford, Hartford Co., CT.
Gershom Sexton married Abigail King, daughter of Thomas King and Abigail Strong, on 20 January 1708/9 at Hartford, Hartford Co., CT.
Isaac Cook Jr. was born on 22 July 1710. He married Jerusha Sexton, daughter of Gershom Sexton and Abigail King, on 13 October 1733. Martha Cook was born in 1740. She married Isaac Cook III, son of Isaac Cook Jr. and Jerusha Sexton, in 1760. Isaac Cook IV was born on 16 July 1768 at Wallingford, New Haven Co., CT. He was the son of Isaac Cook III and Martha Cook. Isaac Cook IV married Margaretta Scott on 25 December 1792 at Chillicothe, Ross Co., OH. Isaac Cook IV died on 22 January 1844 at Chillicothe, Ross Co., OH, at age 75. Margaretta Scott was born on 15 January 1772 at Shippensburg, Cumberland Co., PA. She married Isaac Cook IV, son of Isaac Cook III and Martha Cook, on 25 December 1792 at Chillicothe, Ross Co., OH. Sarah Emmons married Rev. Joseph Morgan, son of Joseph Morgan and Dorothy Parke. Henry Van Kirk was born in 1700 at Hopewell, Hunterdon Co., NJ. He married Dorothy Morgan, daughter of Rev. Joseph Morgan and Sarah Emmons, circa 1723. Henry Van Kirk Jr. was born on 17 December 1740 at Monmouth Co., NJ. He was the son of Henry Van Kirk and Dorothy Morgan. Child of Henry Van Kirk Jr.
William Van Kirk was born on 1 February 1763. He was the son of Henry Van Kirk Jr. William Van Kirk married Deborah Watters in 1785. Deborah Watters married William Van Kirk, son of Henry Van Kirk Jr., in 1785. [S95] Gary Boyd Roberts, Presidents 1995 Edition, Page 67. [S807] Find A Grave, online http://www.findagrave.com, Find A Grave, database and images (https://www.findagrave.com : accessed 9 August 2018), memorial page for Phoebe Elizabeth Dickerson Harding (21 Dec 1843–20 May 1910), Find A Grave Memorial no. 7127142, citing Marion Cemetery, Marion, Marion County, Ohio, USA ; Maintained by Laurie (contributor 2811407) . [S676] Gary Boyd Roberts, Presidents 2009 Edition, Page 98. [S807] Find A Grave, online http://www.findagrave.com, Find A Grave, database and images (https://www.findagrave.com : accessed 9 August 2018), memorial page for Dr George Tryon Harding, Sr (12 Jun 1844–19 Nov 1928), Find A Grave Memorial no. 7127160, citing Marion Cemetery, Marion, Marion County, Ohio, USA ; Maintained by Find A Grave (contributor 8) . 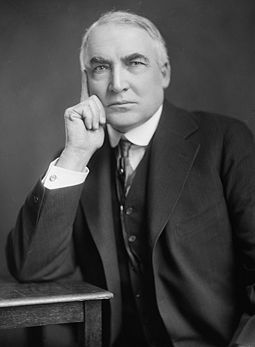 Harding was the 29th President of the United States, serving from 1921 until his death from a heart attack in 1923. A Republican from Ohio, Harding was an influential newspaper publisher. He served in the Ohio Senate (1899–1903) and later as the 28th Lieutenant Governor of Ohio (1903–1905) and as a U.S. Senator (1915–1921). His conservative stance on issues such as taxes, affable manner, and campaign manager Harry Daugherty's 'make no enemies' strategy enabled Harding to become the compromise choice at the 1920 Republican National Convention. During his presidential campaign, in the aftermath of World War I; he promised a return to "normalcy"; an "America first" campaign that encouraged industrialization and a strong economy independent of foreign influence. In the 1920 election, he and his running-mate, Calvin Coolidge, defeated Democrat and fellow Ohioan James M. Cox, in what was then the largest presidential popular vote landslide in American history since the popular vote tally began to be recorded in 1824: 60.36% to 34.19%. President Harding headed a cabinet of notable men such as Charles Evans Hughes, Andrew Mellon, and future president Herbert Hoover. However, he was careless with other associates and rewarded his close friends with powerful positions. Scandals and corruption would eventually be found in the Harding Administration; Secretary of the Interior Albert B. Fall was jailed for involvement in the Teapot Dome scandal; Director of Veterans Bureau, Charles R. Forbes was involved in bribery and price skimming from bootleggers and drug dealers. In foreign affairs, Harding rejected the League of Nations; signed a separate peace treaty with Germany and Austria formally ending World War I. He also led the way to world Naval disarmament at the 1921–22 Washington Naval Conference. Domestically Harding signed the first child welfare program in the United States and dealt with striking workers in the mining and railroad industries. Warren and Florence had no children. WASHINGTON — She was denounced as a “degenerate” and a “pervert,” accused of lying for money and shamed for waging a “diabolical” campaign of falsehoods against the president’s family that tore away at his legacy. The Nan Britton affair was the sensation of its age, a product of the jazz-playing, gin-soaked Roaring Twenties and a pivotal moment in the evolution of the modern White House. It was not the first time a president was accused of an extracurricular love life, but never before had a self-proclaimed presidential mistress gone public with a popular tell-all book. The ensuing furor played out in newspapers, courtrooms and living rooms across the country. Charles Henry Leicester Stanhope Viscount Petersham was born on 20 July 1945. He married Virginia Alleyne Freeman-Jackson, daughter of Capt. Harry Freeman-Jackson and Dorothy Alleyne d'Aubigny d'Engelbronner, on 14 September 1966. Virginia Alleyne Freeman-Jackson was the daughter of Capt. Harry Freeman-Jackson and Dorothy Alleyne d'Aubigny d'Engelbronner. Virginia Alleyne Freeman-Jackson married Charles Henry Leicester Stanhope Viscount Petersham on 14 September 1966. Capt. Harry Freeman-Jackson was born circa 1910. He married Dorothy Alleyne d'Aubigny d'Engelbronner, daughter of Louis Antoine d'Aubigny d'Engelbronner and Anna Chickering Sumner. Dorothy Alleyne d'Aubigny d'Engelbronner was the daughter of Louis Antoine d'Aubigny d'Engelbronner and Anna Chickering Sumner. Dorothy Alleyne d'Aubigny d'Engelbronner married Capt. Harry Freeman-Jackson. Dorothy Alleyne d'Aubigny d'Engelbronner died circa October 1992. Louis Antoine d'Aubigny d'Engelbronner married Anna Chickering Sumner, daughter of Edward Alleyne Sumner and Florence Amelia Bingham. Anna Chickering Sumner was born in 1871. She was the daughter of Edward Alleyne Sumner and Florence Amelia Bingham. Anna Chickering Sumner married Louis Antoine d'Aubigny d'Engelbronner. Anna Chickering Sumner died in 1950. Edward Alleyne Sumner was born circa 1839. He was the son of William Russell Sumner and Anna Alleyne Chickering. Edward Alleyne Sumner married Florence Amelia Bingham, daughter of Henry Harrison Bingham and Amelia Wells. Edward was enumerated in the 1880 Jackson, Jackson Co., MI, federal census. He was the Secy. of a Mfg Company, age 40. Also enumerated in the household were sister Florence 28, daughter Anna C. 8, and son Edward A. 5. Florence Amelia Bingham was the daughter of Henry Harrison Bingham and Amelia Wells. Florence Amelia Bingham married Edward Alleyne Sumner, son of William Russell Sumner and Anna Alleyne Chickering. William Russell Sumner was born circa 1800 at MA. He married Anna Alleyne Chickering, daughter of Jabez Chickering Jr. and Dorothy Deborah Forster Alleyne. William R. and Anna were enumerated in the 1850 Dedham, Norfolk Co., MA, federal census. He was 40, she was 38. Childlren in the household were Edward A. 10, Anna R. 8, and Martha B. 5. Anna Alleyne Chickering was born circa 1811 at MA. She was the daughter of Jabez Chickering Jr. and Dorothy Deborah Forster Alleyne. Anna Alleyne Chickering married William Russell Sumner. Henry Harrison Bingham married Amelia Wells, daughter of Dr. Cyrus Wells and Asenath Fitch Chipman. Amelia Wells was the daughter of Dr. Cyrus Wells and Asenath Fitch Chipman. Amelia Wells married Henry Harrison Bingham.